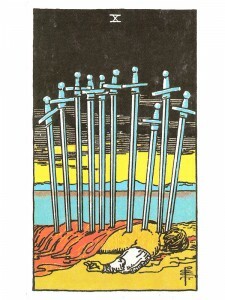 Ten of Swords asks – are you feeling that your friends have turned against you? Are you experiencing the end of delusion in a spiritual matter – feeling as if you have been stabbed in the back? Are these feelings creating extreme unhappiness, depression and a deep sense of loss? Tomorrow always dawns new hope! Release the fears that led you to this negative thinking – the thoughts that created your conscious decision that things would not work out. Allow yourself the right to give up – turn away from ungrateful friends and abandon this futile project. Stop fighting these losing battles! Rise up and look to help from higher powers. You are growing toward harmony – balance between the material and the spiritual things of the mind. Surrender and you will find that a change has occurred – you have been released. You can choose to run or discover that the monster you fear isn’t half as bad as you “think” it is. Be realistic now – expand your thinking. Your “life is not over”! Make the necessary changes to correct this situation and do not allow it to engulf you again. Use your imagination, pursue your dream. Every vision is an “illusion” until it has become a reality and your reality is dependant on your point of view. Alter your mind and you immediately alter your reality. The completion of a major mental cycle with outcomes as you would have them. The mind succeeds by succeeding itself. The old self is truly dead, killed by your own thoughts – long live the new Self. Death of the little ego self and re-birthing as a new revitalized greater Ego – the true Self has killed the conscious mind’s ability to control you. From now on the intuitive spirit will have greater control. Major philosophical change – the mind has matured and will always function together with the intuitive in all matters of the intellect. With the awakening arrival of the Higher Self – you now function as the chairman of the board over all the lower selves and you can now make some real progress. True intellectual freedom with a strong commitment guided by free will. The soul is free and it is choosing in it’s best interests…mental longevity. In what way are you feeling paralyzed or unable to act? Where do you feel that you have no choice? What are you being forced to accept? What problem can you now let go of? By totally accepting defeat, what are you now free to do? Next to Emperor: You find it difficult to understand why everything happened the way it did. Next to Hermit: There is great need for deep thought – you must consider all future activities thoroughly. Three Fives in the spread: You are experiencing a cycle of sudden change – do not make plans until things are more settled. In the second position: Your greatest physical asset is your mind. It is the bedrock of all your achievements in the hard reality of life in the physical/material realm. In the third position: What dies here is innocence – not guilt. There is no real punishment being administered in the conversion of the conglomeration of little selves called “ego” into the uplifted Self. The reward for achieving the level of knowledge which opens the door to initiation – the beginning in earnest and complete conscious awareness of the lessons of the spiritual level. In the fourth position: The passionate side of self-mastery, is the extraordinary feeling of self-love made possible by the ability of mind to acknowledge the God within, which is at one and the same time the absolute love of God, the God without. To have this guiding your early emotional tapes is fortunate indeed. In the fifth position: You are very aware of the transformation through which you are going. You may even be dealing with this subject of the dark night of the soul for someone else or for purposes of study. In the sixth position: Those less secure in their relationships with you may feel they are losing you. But if anything is lost, it will not be because of anything you do or say. In the seventh position: That wonderful moment lies in the near future, when you will have assimilated enough knowledge and assumed enough of its related responsibilities to be thrust onto the higher path to wisdom. You are smart, you know it, but you will not blow it. In the eighth position: Say goodbye to the old you, hello to the new – for this is a moment of profound change. While this is a transformation centered on the cusp between the mental and the spiritual, there will be profound physical changes as well. While you are intellectually more heavy, having acquired much knowledge and accepted much responsibility, paradoxically you will be much lighter, in spirit. You may appear both older and younger at the same time – older because your wisdom shows through and younger because of your buoyancy. In the ninth position: The heart and therefor your subconscious are immersed in the catharsis of the ego into greater awareness. This increase in knowledge and the greater acceptance of responsibility is enriching the contents of your emotional world, your relationships and your creative endeavors. In the tenth position: Your transition to higher mind in preparation for the robes of the initiate is very smooth. Wanted to pop back and say you were right, thanks my friend, too bad you’re not closer… You knew something I didn’t and I LOVE it. Hello Diana, I was wondering if you may help me of interpreting the 10 of swords which was the 10th position of a celtic cross spread and with the tower card at the bottom of the deck when I turned it over. I’m sort of stuck and paranoid that something bad is going to happen. Every advice and your thoughts about it will be a great help. Thank you. Hello, I’m a tarot reader and was lucky enough to pull a good spread for myself today – then, gulp – my old friend the X of Swords showed up in card position 8. Wanting an objective view I googled and so glad I came across your interpt – instead of my own “someone’s out to sabotage me”. Thank you for these enlightening words. The questions alone really put so much into perspective! and it always lifts me. Do listen if you get a chance. Blessings. I am happy to know that you are receiving valuable information … thank you for your kind comments. This is a fantastic site– your interpretation of the cards is deep and powerful! Thanks so much for creating this valuable spiritual resource. For those of you who support the site, I want you to know it is greatly appreciated. Published in 1983 – Crystal Clear Reflections is celebrating 35 years of service to the internet community.